I had really planned on attending the wake for Hancher. The reminder postcard was on my refrigerator, the event was on my calendar, and I was dressed and ready to head over there but in the end, I just couldn’t go. I wasn’t ready to share my sense of loss with a group, especially one that is also looking to the future. I’m just not there yet. To many, Hancher is just a building—an iconic one for sure, but still, a building. 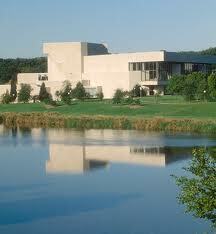 For me, Hancher and the School of Music are the keepers of my past. The ghost of my younger self walks those halls-and you can’t transfer ghosts to a new building. I grew up in those halls—from my times as a high school freshman at music camp, being shocked to discover my favorite choir conductor on whom I had conferred sainthood had an all-too-human habit of smoking (a cardinal sin to a young singer) to my freshman year of college learning that to perform Cosmo Catalano’s staging at the spring opera’s Sunday matinee while quite hung over from the cast party the night before is something one does at one’s peril through my (breathe a triumphant sigh of relief) senior recital in Harper Hall. I grew up in that building by spending thousands of hours singing in practice rooms and rehearsals halls. And like so many students at the time, I felt as comfortable backstage at Hancher as I did in my own apartment. Our experience wasn’t IN the red seats, it was looking at the red seats. I can no longer walk those halls and catch glimpses of my younger self. The dusty, dry scent of the music library, the cacophony of the practice room halls, the cool stillness of Hancher backstage the evening of an opera’s final dress rehearsal—these are all gone, but somehow, having the building’s shell there made me believe that somehow these were still there behind the locked doors and that someday, they would be back. I’m no longer a singer. I think that’s why those ghosts are so important to me. In them, the singer part of me is still around. When Hancher, Clapp, and the School of Music are gone, my ghosts and the singer in me go with them. Even after I was no longer part of the building, Hancher welcomed me each time I drove into town. Coming home is the sweetest part of any journey and the sight of Hancher, lit up and holding court, on the banks of the Iowa River added to that sweetness. The past five dark years have been hard, but I still haven’t gotten use to the darkness in Hancher’s place. So, good-bye you beautiful building. You, and the ghosts you hold, will have to be alive in my memories. There will be another auditorium, another school of music, new experiences, new memories. For me, as impressive as these may be, they just won’t hold my heart like Hancher. That spark of young passion created by the powerful combination of time and place is something that can’t be replicated. Nicely summarized, you speak for all of us who breathed those heady fumes in high school and mused about the future from backstage in college.